Coloring tools, organization (again) and a freebie. A couple of days ago I decided I need to update my Spectrum Noir swatch sheet. Not a small task, I have 264 of them. Doing the swatch isn't the real problem, it is putting the colors together on the sheet and in my storage. This seems to be a common issue with SN users. I thought I'd share the process with you all, maybe it will help. also included are a few photos of how I store all my coloring tools - well those in pen/pencil/pen form! I also thought this would be a fun time to join the WOYWW blog hop- a world wide tour of desk tops! 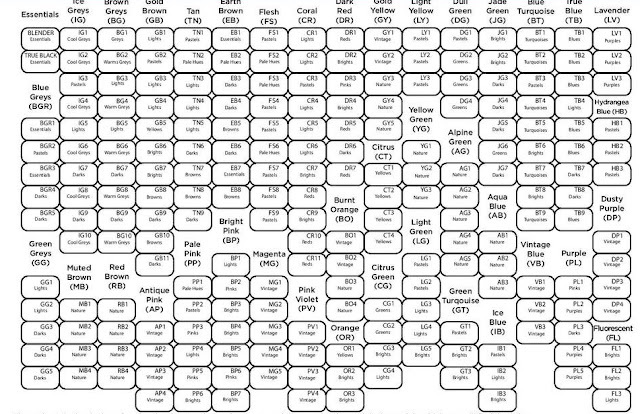 This is the Current SN marker chart, I still have 48 more pens not listed- these are the illustrator colors. so I had to just shade them in. you can right click this and save if it would be useful to you. I started coloring and then cutting so that the color families I put together would be similar to how they were stored. I still need do a swatch sheet for my other set of AP's. Alcohol markers, colored pencils, Waterbased markers, Brush tip markers, Wink of Stella, and TH markers. Primarily for cards. Watercolor pencils, Pens and Pitt Pens, Bible Journaling, coloring. I only do coloring and design work at this desk, my computer is right behind, I can swivel right to the keyboard and screens. Printer and cutting machines are on desk and counter next to the computer. This is my desk for card making and any wet work. I also have a sewing machine to put at that far end to start stitching on cards. I don't have a lot of "Stuff", But I do have a lot of paper and inks and coloring things. Because I do digital and real stamps, I have a lot of images. My main focus on card making is color and composition. I mail everything I make - so I make all my cards mail-able, that is really important to me. I don't mind if it is heavy and I need extra postage, but they are never so dimensional that I can't put them in an envelope. Hopefully, you might find this helpful, I always like to see how people do things in an effort to do them better myself. I have a lot of coloring mediums, not as many as you. I get asked why do I have so many? What do you answer to that? That is a question I only get asked by non crafters! my answer is usually "this has been a life long hobby and a part time profession and ministry. These things supply the need. When you think the human eye can see 256 million colors, I have a long way to go!" I don't buy make up or jewelry or get my nails done, I don't gamble, my house is clean and the food ready - It is my passion and I love when people ask me that question! Hi Ginny. Seems a long time since seeing you here on WOYWW, although I pop over and see what you are up to on occasions. My goodness - well, from your answer to Mary, it's very obvious to me that I don't do a lot of colouring... I do regard my creative work as a ministry - one which Father God encourages me in and has told me to work at - but I'm not a great colourer - unless it happens to be water colour pencils... Your storage is fantastic. Well organised. Ginny. Utter bliss. Those cubbies full of colouring tools say in pictures exactly why I craft. Access to colour. I love your description too, of the way you make card for mailing...me too, absolutely. Also because I don’t have the patience for dimensional and complicated! Hi Ginny, fixed link on FB you’d put the one to Stamping ground ... and as said on FB love the desky share of stunning colour graduations but to be be honest I’m glad they’re yours and not mine. I couldn’t cope with that many... I love love love how neat they they are though. Welcome back. What a sight for the eyes your storage for pens/pencils is. I don't think I know anyone with so many, you must love colouring and obviously have an eye for colour. Reading between the lines I would say you have a large (very large?) craft room and I would love you to take us on a tour week by week of different areas. Thanks for the SN download - not that I have any but I am sure many people do. What a wonderful feast of colour, Ginny. A real delight to look at! I love your colour swatches too. Thank you so much for your lovely comment and I'm glad you enjoyed seeing my album - thank you for your very kind words. As for the snow, it's 99% gone now, but they do promise more over Easter. I shall start singing "I'm dreaming of a white Easter" lol!